The Mystic River Reservation is a publicly owned nature preserve with recreational features located along the Mystic River in the towns of Winchester, Arlington, Medford, Somerville, Everett, and Chelsea in eastern Massachusetts. The reserve is part of the nearly 76-square-mile (200 km2) Mystic River watershed. It is managed by the Massachusetts Department of Conservation and Recreation. The reservation was established in 1893 by the newly formed Metropolitan Parks Commission (later renamed the Metropolitan District Commission), making it one of the first official nature preserves in Massachusetts, and one of five designed by the commission in that year. Of these five, three were planned as woodland river reservations: the Mystic River Reservation, Charles River Reservation, and Neponset River Reservation. The Mystic River Reservation originally comprised a little over 250 acres (100 ha) of land. By the early 20th century, most of the land along the Mystic River in Medford, Arlington, and Somerville had become public (i.e. state-owned) land. In 2010, the DCR unveiled a plan for restoring and preserving the reservation, called the Mystic River Master Plan. Proposed projects included a partnership between the DCR and the City of Medford to restore the Condon Shell (an outdoor amphitheater located just outside Medford Square); restoration of the Amelia Earhart Dam basin parklands; and a $3.6 million federally funded link between the reservation, the Minuteman Bikeway, and the Alewife "T" Station. The lower parkland is being redeveloped as part of Assembly Square construction. Facilities for field sports, picnicking, cycling, and sailing are found at four riverside parks: Draw Seven Park in Somerville, Torbert MacDonald Park in Medford, the Mystic Lakes in Winchester, Arlington, and Medford, and Mary O'Malley Waterfront Park in Chelsea. ^ a b "Mystic River Reservation". Geographic Names Information System. United States Geological Survey. ^ a b c "Mystic River Master Plan" (PDF). Massachusetts Department of Conservation and Recreation. November 2009. Retrieved September 15, 2015. ^ a b "Mystic River Reservation". MassParks. Executive Office of Energy and Environmental Affairs. Retrieved August 23, 2013. ^ a b c "Division of Urban Parks and Recreation History". Department of Conservation and Recreation. Archived from the original on March 10, 2013. Retrieved August 23, 2013. ^ a b A history and description of the Boston metropolitan parks. Published under the authority of the Metropolitan Park Commissioners by the Board of Paris Exposition Managers. 1900. p. 20. Retrieved May 28, 2011. 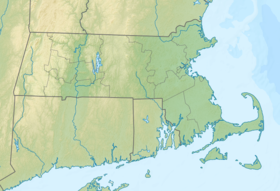 Wikimedia Commons has media related to Mystic River Reservation. This page was last edited on 15 April 2019, at 11:57 (UTC).